Please be aware of third parties selling fictitious room reservations. 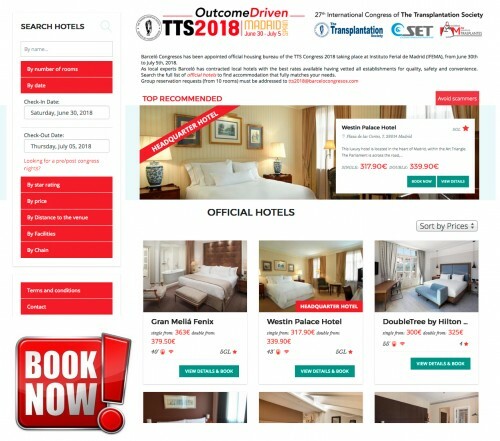 These companies may mislead event participants by representing themselves as the official congress accommodation provider and may use a range of tactics to deceive including usage of the TTS logo. In some cases event participants have been led to believe that they had made a reservation, only to arrive at the event to find that no reservation has been made and their credit cards may have been charged. Barceló Congresos is the only housing partner authorised by TTS. TTS does not recommend using any other supplier and to be cautious when disclosing personal information to third parties. Access to the housing reservation platform is now ready. We strongly advise all congress participants to reserve their hotel accommodation as soon as possible. Barceló Congresos will not be able to guarantee rooms after May 2018. Pl. Europa 17-19, 1a plta.